The Skinny: Occasionally amusing but mostly uninteresting costume comedy which features decent fight sequences, but also an abundance of interminable comedy. by Kozo: This costume kung-fu comedy attempts the same brand of comedy as Stephen Chow's Flirting Scholar. However, unlike Flirting Scholar, this movie doesn't have Stephen Chow. It's also not very funny. 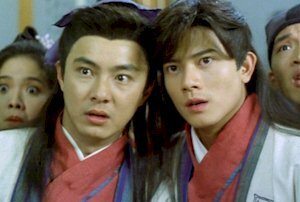 Dicky Cheung stars as Lun, a poor but tricky scholar who's the class cut-up. He teams with kung-fu kid Lau (Aaron Kwok) to rule the classroom, which is run by a typically wacky Ng Man-Tat. However, Tat's niece Ching Ching (Vivian Chow) is also in attendance, which means everyone lusts after her. Plot occurs when their school must best a rival school in an intercollegiate competition. But, substitute teacher Li (Leung Ka-Yan) is secretly a martial arts superstar, and is on the run from Imperal bad guys led by Gordon Liu. Can these wacky kids win the competition and do away with a motley collection of evil bastards? And, will the musical sequences drive you to destroy your television?